Sometime between Thursday at 3pm and Monday at 12pm I have to customize my Farm Fresh Delivery bin. This means I get to fill my bin with as many of the fruits and vegetables available that week as I can for f$25, and then go virtual grocery shopping and add things like fresh, local pasta, local coffee and mustard, farm fresh eggs, and organic soy milk. If I forget to customize my bin, Farm Fresh delivers my standing order – the grocery items I’ve designated to be automatically delivered every week and the produce they automatically select to go in bins. This is not a bad thing, but sometimes, like last week when I forgot to customize, I end up with four peaches and four apples. Too much fruit for me to consume. After eating peaches in my oatmeal for a few mornings, I decided to stick the rest of the peaches into a baked good of some sort. 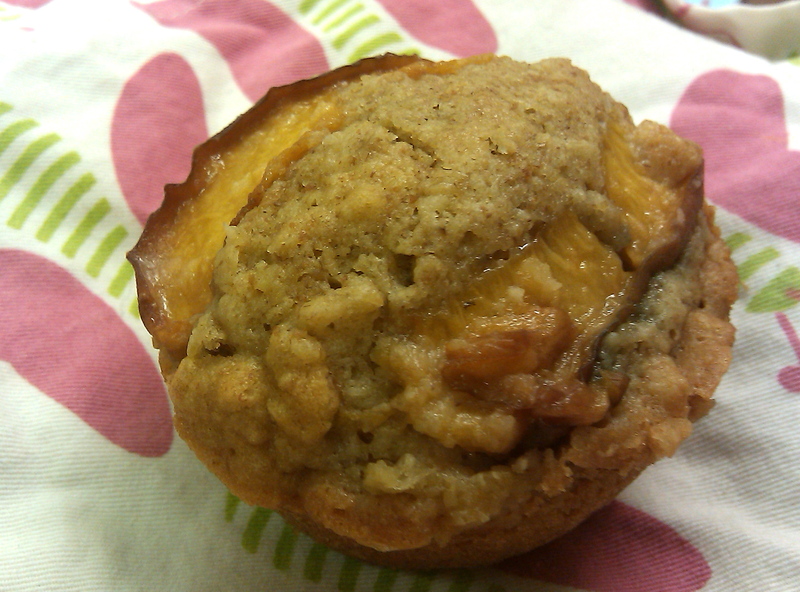 Ginger peach muffins to the rescue! I hate the way fresh ginger smells. Kind of like cleaning solution. So I don’t really cook with it too much, which is a real mistake I think. Turns out ginger pairs amazingly with peaches. I also hate grating anything, so grating fresh ginger for this recipe was chore, but a chore well worth it. I think my favorite part about these muffins is the nice, buttery smell of the peaches on the tops. This was also my first attempt at baking with agave nectar instead of sugar. I think it went well. The general rule to subbing agave for sugar seems to be use 2/3 – 3/4 the amount of sugar in your recipe and reduce any liquids (milk, water, soymilk, etc.) by 1/4 – 1/3. Also, drop your baking temperature by 25°. Preheat oven to 325°F. Rub inside of muffin tins with butter and set aside. Put butter, honey, and fresh ginger in a skillet over medium heat. When warm, stir to combine and gently simmer for 2 minutes. Add peach slices, carefully toss to combine and set aside. 1. In a large bowl, combine the muffin ingredients oat flour through salt (that’s all the dry ingredients). 2. Combine the melted butter through crystalized ginger (that’s all of the wet ingredients) in a bowl with a whisk. With a spatula or spoon, gently mix the wet ingredients into the dry ingredients, stirring until just combined. 3. In a bowl, combine the uncooked peach slices and a bit of flour. You just want to coat the peaches so they won’t sink to the bottom of the muffins. 4. Using a spoon, fill muffin tins half way full. Set a few of the flour-coated peach slices on top. Fill the muffin tins up the rest of the way with batter. 5. Lay a couple of cooked peach slices on top of each muffin. Spoon the peach topping juices over the peaches. 6. Place the muffins into middle rack in the oven. Bake for 25 minutes, or until the muffins are golden, the peaches caramelized, and a toothpick comes out of the center of the muffins clean. Remove from oven and let cool on a cooling rack. Do you think the batter would work in a cake pan or bundt pan like gingerbread? Hmm…I think you could safely bake it in either a loaf pan or a round cake pan, just maybe with adjusting the time (in the oven longer). You may have to double the recipe for a bundt pan though since they hold like twice as much batter as a round or loaf pan. 1. When you buy it, clean it and cut it into small chunks/slices (don’t bother peeling). Then store it in the freezer and take out chunks as you need them – no more spoiled ginger. 2. Get a good microplane zester/grater and use it to shave the frozen ginger chunks right into your soup pot or mixing bowl. It makes it into a neat little pile of ginger snow; no more peeling or dealing with all the stupid little strings.